Populus tremuloides – This tree was named because of the way the leaves flutter or tremble in even a light breeze. In Latin: Populus tremuloides Michx. Aspen poplar is a slender deciduous tree that grows up to 30 m (100 ft.) tall. It is common in much of Canada’s parkland and boreal forest. Bark: These trees have smooth, light green or whitish bark. Large trees can be blackish and fissured at the base. Buds: Winter buds of poplars have several scales, unlike those of willows, which have a single bud scale. The buds of aspen poplar are not coated with a fragrant, sticky resin like those of balsam poplar (Populus balsamifera). Leaves: In aspen, the leaf stalks (petioles) are vertically flattened. They attach to the leaf blade at right angles to the leaf surface. The leaf stalks are also relatively long. These characteristics make the leaves tremble or quake even in a light breeze. The leaves are light to medium green and relatively small – 3 cm – 7 cm (1 1/4 – 2 3/4 in.) long. They are almost round or broadly egg-shaped, except for the small, sharp tip. In contrast, the leaf stalks of balsam poplar are round and not flattened; and the leaf blades are much longer than they are wide. It is important to learn the difference between aspen and other poplars. Look beneath the tree for last year’s leaves, and check that their shape matches the sketch. Trees: Poplar trees are either female or male. In spring, both “boy trees” and “girl trees” produce gray, woolly catkins, or dense clusters of tiny flowers. The catkins on male trees shed pollen, and those on female trees produce seeds. Flowers: The catkins swell and lengthen in very early spring before the new leaves emerge. They look like soft caterpillars hanging down from the stems; blooming is completed before leaves emerge. 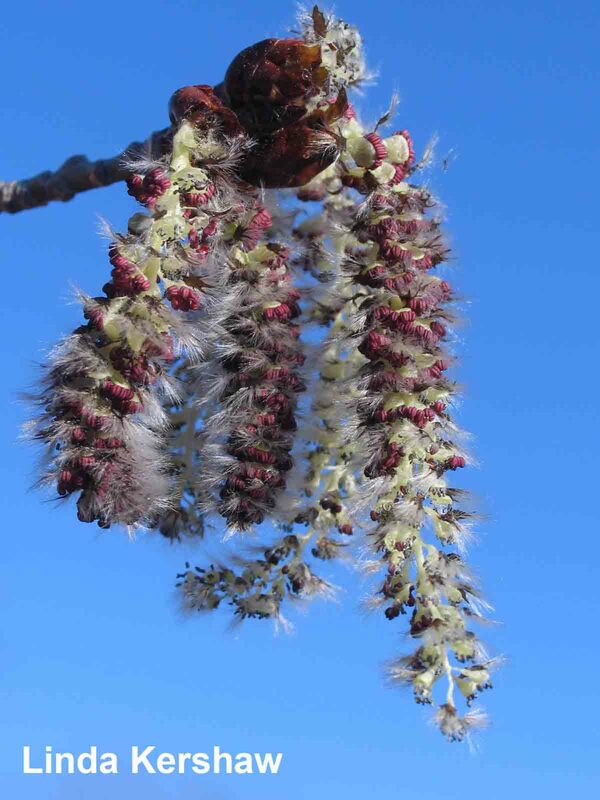 Male flowers: Fuzzy catkins on male trees emerge in late winter, and lengthen in early spring to about 6 cm (2 1/2 in.). As they lengthen, their colour changes from gray, to pinkish (color is from pink pollen sacs), then they turn pale yellow, and, finally, gray, once the pollen sacs have split to release the powdery,yellow pollen to the spring wind. The spent, gray catkin gradually dries and falls off the tree. Female flowers: Grey catkins (colour is from the hairy bracts) first turn reddish. Wind-blown pollen lands on the stigmas and pollination occurs. Very soon the catkin turns green as it grows and lengthens. It is fascinating to see the changes – use a magnifying lens, or dissecting microscope to see this. The mature female catkin, about 10 cm (4 in.) long, holds many slender, green, conical capsules, 3 mm – 5 mm (1/8 – 1/5 in.) long and warty, each containing tiny, light brown seeds with white fluffy hairs. After flowering finishes, seeds take four to six weeks to develop. Then the seed capsules split, and the air carries the buoyant seeds, which can form puffy snow-like drifts that line forest trails. 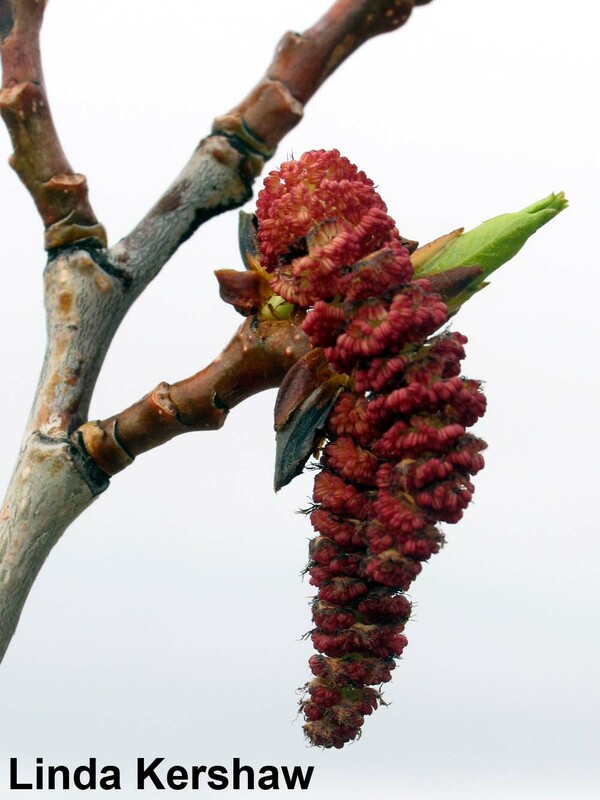 Click here to view a larger image of female poplar catkins. Aspen poplar is found in a variety of habitats from low elevations up to the subalpine. It is a common tree of dry and moist woods and prairie parklands. It grows best in well-drained, moist but not wet, loamy soils. It is considered a pioneer species – the first species to appear after a disturbance such as fire or logging – and cannot tolerate shade. For Plantwatch, it is important to know the difference between male and female trees. Only information on the flowers and leaves of male trees should be recorded. In very early spring, locate several aspen poplar trees with low branches. Use masking tape and a permanent marker to label different trees (#1, #2, etc.). Find a branch within reach on each tree that has already small catkins, or at least large buds. Remove a small branch and mark with tape with the correct tree number. For example, mark both the removed twig and another branch left on the tree as #1. Mark another tree as well as the twig removed from that tree as #2, and so on. Place the removed twigs inside your house or school in a jar of water. Place a dark paper or cloth under the jar. Soon the catkins will get longer and turn pinkish. If the branch is from a male tree the catkins will then turn pale yellow and shed yellow pollen at the slightest touch. Outdoors, the wind quickly blows pollen away, so try this to be sure of your tree. Female catkins do not have pollen. 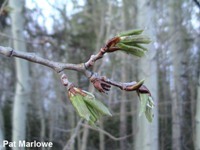 If the catkins on your outdoor tree eventually turn green, the tree is female, and the search for male trees continues! If you have a magnifying glass or dissecting microscope available, discover the beautiful structures inside the opening catkins! Poplar flowering is tricky to observe. Follow these steps to have successful poplar observations! 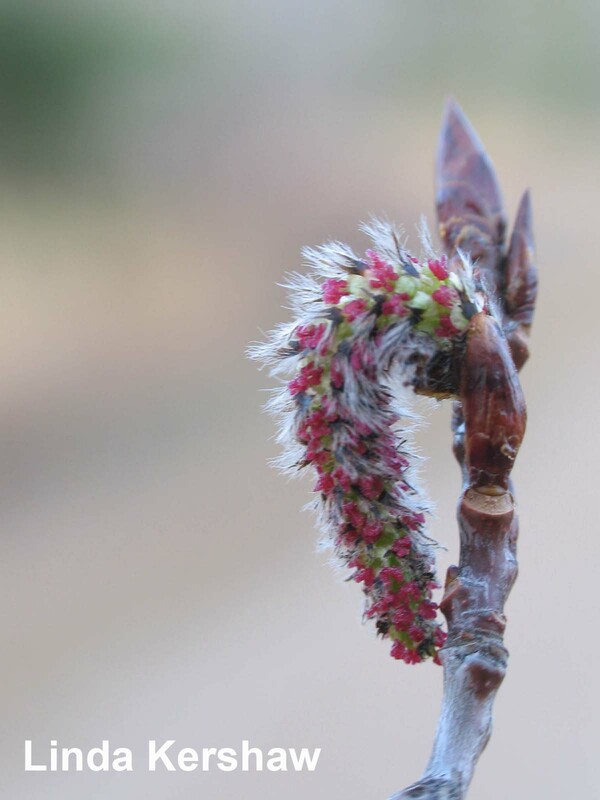 Once you are sure you have a male tree, start watching it when the catkins are about 1 cm (2/5 in.) long. If the temperature climbs above 10oC (50oF) for a few days, then check your tree daily. Please record the dates for both flowering and leafing. 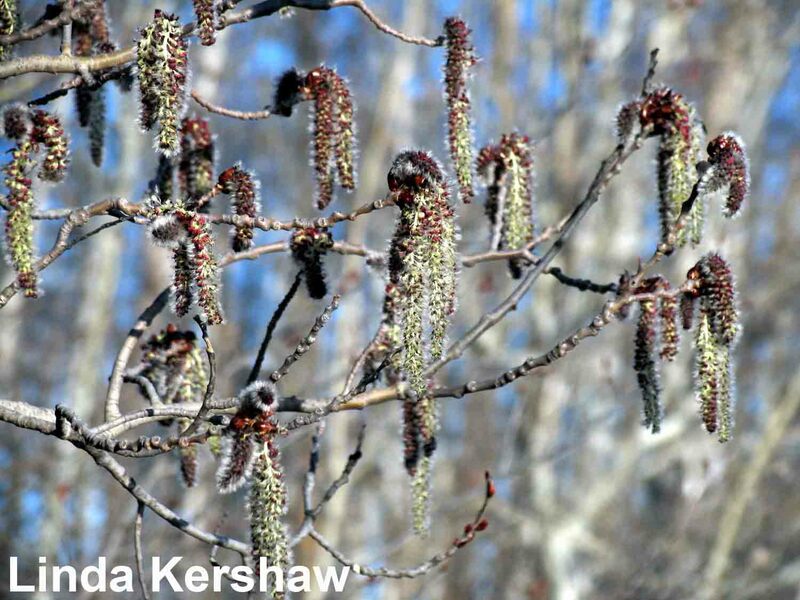 Watch for the first date when the catkins release a small cloud of yellow pollen if the branch is touched slightly. 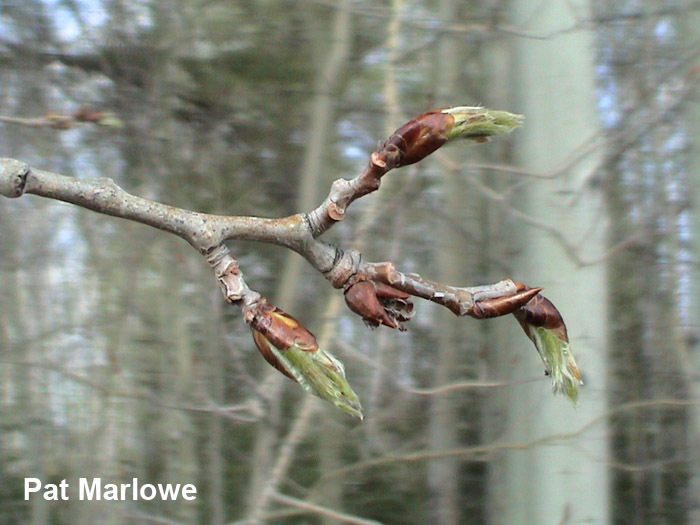 Flowering can be over in two or three days, so watch your trees carefully in early spring! Leafing occurs later than flowering. First bloom: when the catkins on the male tree first start shedding pollen (in 3 different places on the tree). There may be a few unextended catkins (some may later dry up without releasing pollen at all) and a few with unopened pink pollen sacs. At this stage there should be no dangling, dry or withered catkins on the tree. 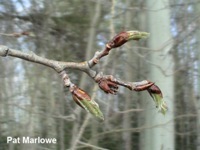 Leafing: when the first leaves have emerged and unfolded completely in 3 different places on the tree. 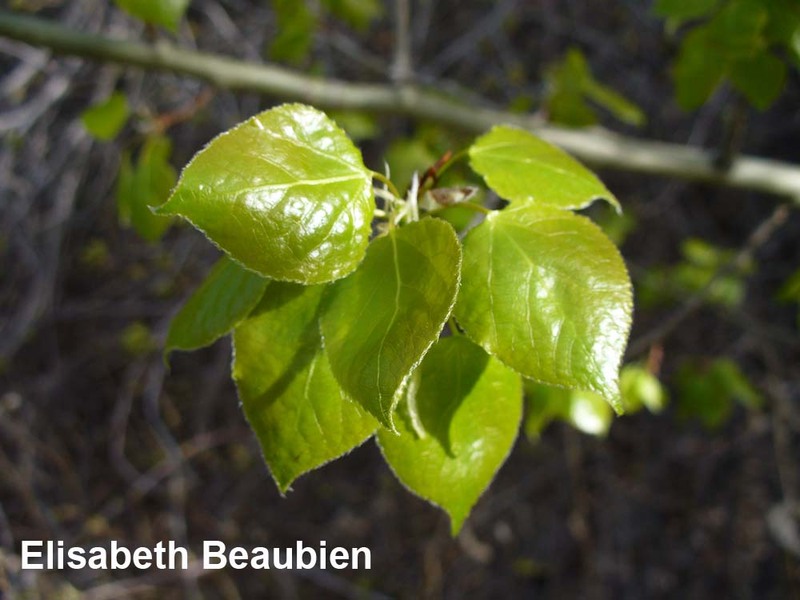 Because aspen poplar leaf-out times (like flowering) are influenced by temperature, they can be used to monitor the biological effects of climate change. Additionally, with the help of satellites, leafing (or “green-up”) can be monitored over a much larger geographical area than can flowering (which requires on-the-ground observation). However, information that is received via satellite must be correlated with the leaf-out that is happening on the ground. 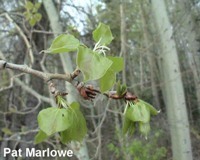 Aspen poplar flowers are wind-pollinated. 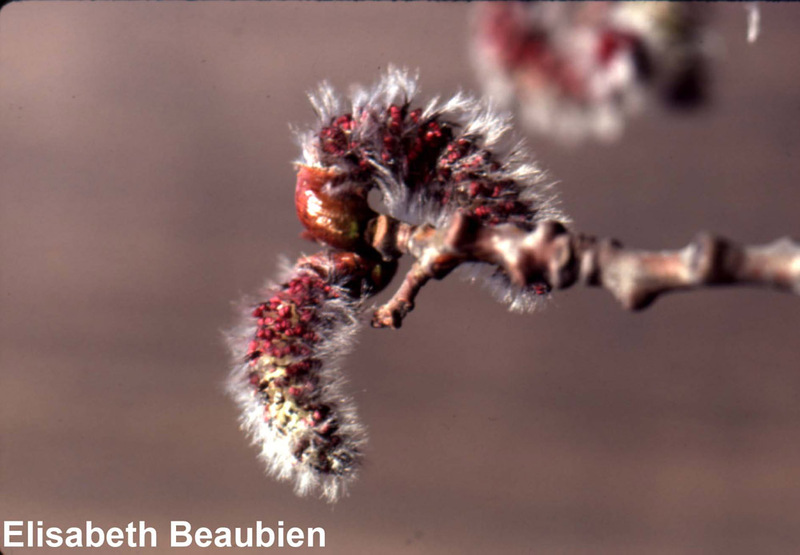 Spring winds, unhampered by tree leaves, carry pollen from male catkins to female catkins on another tree. The pollen fertilizes the ovules in the female catkins and seeds result. The seeds are carried by the wind. Hairs on the seeds help carry them on their airborne journeys, up to 30 km (20 mi.) in storms. However, the seeds are viable only for a short period, from three days to three weeks. They require bare, wet soil for successful germination. Aspen flowers and leafs out early in the growing season, and full bloom of aspen can be used to define the biological start of early spring. In much of Canada’s West, aspen is flowering when flocks of geese are pouring north, wood frogs are calling, mountain bluebirds are finding nest sites, and sharp-tail grouse are doing their dawn dances. Prairie crocus often starts blooming at the same time aspen does. In autumn, leaves turn bright yellow, or occasionally, orange. Aspen poplar groves provide important wildlife habitat. The bark and leaves of this tree are the favourite food of beavers, which use the branches to build their lodges and dams. Young twigs and leaves are browsed by hoofed animals such as deer, moose and elk. (Aspen is one of the top six favourite non-aquatic foods for moose.) When other food supplies are low, these mammals will eat the bark. Snowshoe hares eat the bark, and grouse eat the winter buds. This species is fast-growing but lives only a short time, up to 80 – 100 years. It regenerates quickly after fire or tree cutting by suckers from roots near the surface of the ground. Thus, aspen is an important fire-successional species in the boreal forest. Aspen matures in 60 – 80 years, and succession is often to white spruce as long as there is adequate soil moisture. Forest fire is an important element in the establishment and maintenance of aspen stands. Aspen poplar forests appear to be stable communities that dominate large areas of the landscape. In fact, they are really transitional communities dependent on frequent fire for establishment and rejuvenation. A fire frequency of approximately 100-300 years is needed to keep aspen stands healthy. However, because aspen stands do not burn burn easily – they are sometimes called “asbestos forests” – researchers believe that in the past, burning conditions for such fires must have been very hot and intense. Fire affects aspen in a variety of ways, depending on its intensity and on soil factors. Generally, most fires kill the above-ground parts of the plant. Even when they are not killed outright by fire, burnt trees have a greatly increased potential for wood rot. But the below-ground parts usually survive, and fire promotes suckering and sprouting from root crowns and stumps. Fires also result in increased soil temperatures and reduced competition, so that aspen stands often form the dominant vegetation type after fire. Since the arrival of Europeans in North America, fire suppression and grazing have upset this natural cycle, and healthy aspen stands are decreasing in number. 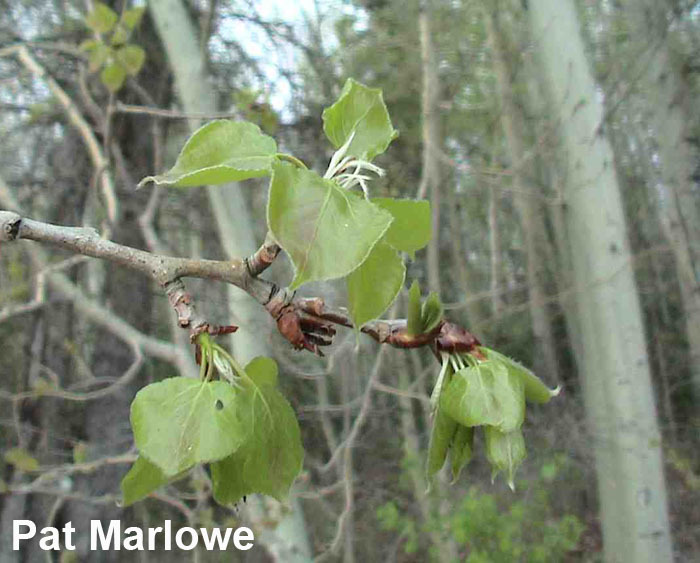 First Nations People named the aspen poplar “the noisy tree” because of the sound of fluttering leaves. 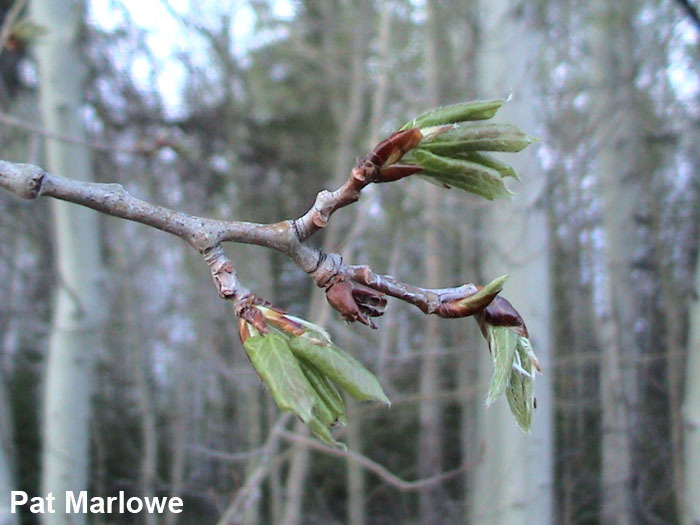 The buds, inner bark and leaves of this tree were important sources of natural curatives used by First Nations People such as the Cree and, through them, the early settlers. The active ingredient in aspirin occurs in the inner bark of aspen. The Cree made a tea from the inner bark that was helpful in treating rheumatism, diarrhea, liver and kidney problems, and coughs. A similar tonic, with the addition of tree fungus, eased earaches. Aspen leaves relieved the itch of insect stings. On the sunny side of open-grown aspen trees, the photosynthetic bark produces a protective white powder, which was used by First Nations Peoples as a sunscreen. Canoe paddles and tipi poles were commonly made from aspen wood. Now, aspen poplar is cut down for pulp and to make oriented-strand board. Wooden matches are made by steaming poplar logs and peeling the wood layers. Aspen is a great tree to grow on a rural property or in a large schoolyard. It is very hardy in drought and in extremes of heat and cold. It grows fast and is very persistent. It is the first tree to leaf out in the spring and the last to lose its leaves in the fall. A stand of aspen can also be an important habitat and food source for wildlife. It can also be used for an average-sized yard, but for a small city garden there are some concerns. Although aspen is easily grown, it is susceptible to rot, insects and disease, and the roots can send up many suckers and grow to block sewer pipes if pipes are leaking. Gardening Tip: Plant your potatoes when the leaves appear on aspen trees. From Dr. Stewart Rood – Poplar biologist and professor at the University of Lethbridge, Alberta, 1997. Brayshaw, T.C. 1996. The catkin-bearing plants of British Columbia. Royal British Columbia Museum, Victoria, British Columbia. Craighead, F.C., Jr. 1994. For everything there is a season: the sequence of natural events in the Grand Teton-Yellowstone Area. Falcon Press, Montana. Johnson, D., L. Kershaw, A. MacKinnon, and J. Pojar. 1995. Plants of the western boreal forest and aspen parkland. Lone Pine Publishing, Edmonton, Alberta. Parish, R., R. Coupe, and D. Lloyd. 1996. Plants of southern interior British Columbia. Lone Pine Publishing, Edmonton, Alberta. Scoggan, H. J. 1978. Flora of Canada. Natural Museum of Natural Science Publications in Botany No. 7, Ottawa, Ontario. Stettler R.F., H.D. Bradshaw, Jr., P.E. Heilman, and T.M. Hinckley, eds. 1996. Biology of Populus and its implication for management and conservation. NRC Research Press, Ottawa, Ontario. Viereck, L.A., and E.L. Little. 1972. Alaska trees and shrubs. Forest Service, USDA, Washington, D.C.